Last week, we collaborated with ZHA | Code on a parametric design workshop at ACADIA 2014, an annual conference focused on the future of architecture and computer-aided design. ZHA | Code is the programming arm of the renowned Zaha Hadid Architecture. During the ACADIA workshop, the designers developed some really exciting geometry for the Form 1+ 3D printer. A pavilion shell printed on the Form 1+, whose delicate linework was created by an algorithm simulating water flow. Architectural studies in progress on the ACADIA workshop print farm. The students captured the random movement of particles using a physics simulator, which were then transformed into meshes, generating models that could be imported into PreForm. 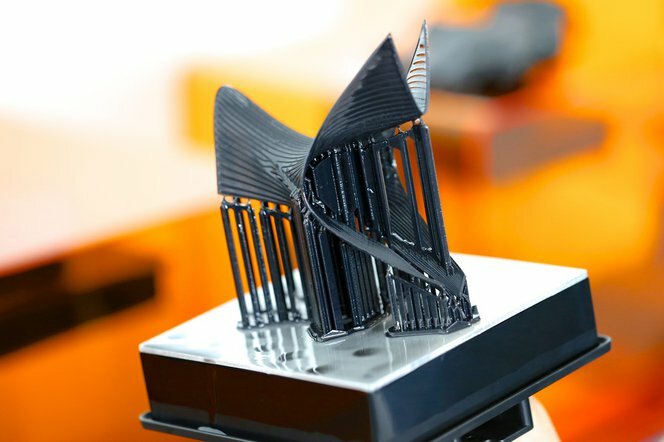 Part of the design challenge was to explore the limits of what a 3D printer was capable of; the output files had intricate undercuts, small features, and overhangs - the types of geometry typically impossible to make on desktop 3D printers. Students in the workshop developed algorithmically created geometry studies using physics simulation. Iterative prints with increasingly complex geometry created during the 3-day workshop. Learn modeling strategies and software workflows for producing intricate architectural models in-house. Download the free white paper to learn how to make smart modeling decisions, from choosing scale to designing for assembly to post-processing, and how to use these strategies in common software ecosystems.